Specifically, the 28th December 1971. The telescope was a Christmas present. I was 11. 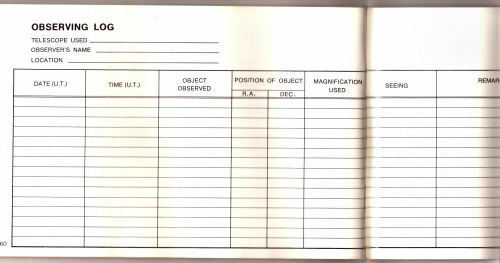 The book that came with the telescope had a sample log page, and I copied it to a note book. In my note book I didn't bother with Dec and RA because I had no way of determining them, but I put in the constellation instead. Looking back at the log, judging by the gaps, I think there were nights when, as a teenager, I didn't see anything interesting so I didn't bother - especially if there was something I wanted to see on television after I got in! Today I just type it up into a text document which is far neater. It is great to add images of the objects too. Far better than the embarassing drawings I did in the early days! I think getting a new telescope is a good time to start a log. I've used my RAS diary on and off over the last couple of years but I'm not very good at keeping it up! When we move next month I'll have a man cave with laptop next to the telescope patio so keeping the log up to date will be a lot easier. All I'll need then is to retire and become nocturnal! There have been periods of time when I have been quite sloppy with log keeping. Knowing that no one else is likely to read it doesn't give much incentive. One way is to write up the entry and post it on the forum. My log entries certainly became a lot more chatty when I am writing them for a forum post. Are you thinking of a small shed nearby, to keep your accessories etc. in? Aratus wrote: Are you thinking of a small shed nearby, to keep your accessories etc. in? The house has a garage (man cave) to the side which has a door to the rear out to the telescope patio.